Being a bad boy has always been in style. From the earliest fables to modern movies, bad boys have a way of getting what they want, especially when it comes to finding a significant other. Not many can resist a guy who's got a bit of a bad streak in him. Is going to prison taking it too far? Eh, who can say. But if you're going to be bad, you may as well look the part. Let's say you already have the perfect prison jumpsuit. It's got the whole nine yards: black and white stripes, buttons up the front, and even its very own number. But what's missing? The hat, of course. You can't be a true prisoner without a matching prisoner hat. 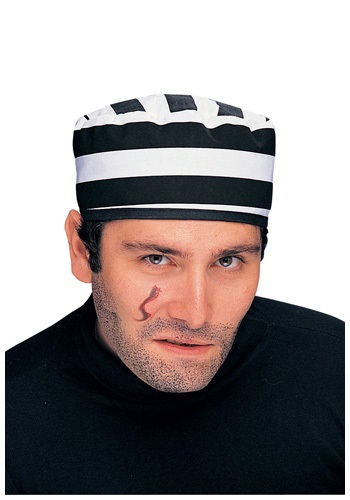 This prisoner hat is just what you need to complete your bad boy look this Halloween. The hat is made of 100% polyester and it has the classic pill box shape with standard black and white stripes. A simple, yet essential way to complete your costume.